At the end of the American Civil War the Freedmen’s Bureau was created to assist displaced people, mostly those African-Americans, who no longer lived in the former farms and plantations they have worked on as slaves. It was a bill signed by President Lincoln in March 1865 and was operated during Reconstruction by the Dept. of the War. 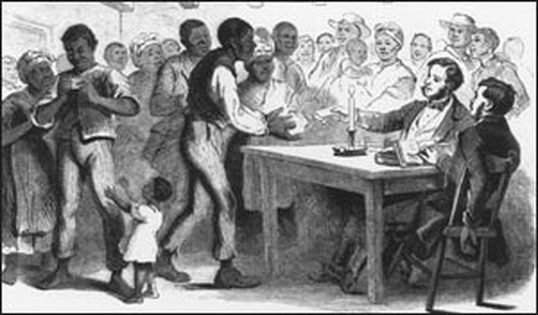 It assisted African-Americans especially in the Southern states in locating family members, to find housing, provide education, and employment. A major problem found by the Bureau was that medical treatment of the freedmen was severely deficient. Most southern white doctors and nurses would not treat freedmen, infrastructure had been destroyed by the war, and people had few means of improving sanitation. Blacks had not had much opportunity to develop their own medical personnel. In this period epidemics of cholera and yellow fever were carried along the river corridors, breaking out across the South. So special hospitals were established to help care the ill, those who were refugees or freedmen between 1865 and until funding from the Federal government was cut off in 1872. The FamilySearch.org site has in digital format the bureau’s records of hospital patients. Use the search boxes to place a surname or location. With over 82,000 digital images with multiple names to each page, there are many names available. In the hospital listings, a person’s name and hometown are listed. More important what medical condition they were being treated for is listed and for how long. The type of information can vary. A person’s age or date of birth can be found in some records. Viewing the various illnesses and diseases during this post-Civil War period is fascinating. Dysentery was a major health problem, as well as pneumonia, various fevers, and diarrhea. Reminder, the bureau also helped displaced – refugees after the war, so many different individuals received assistance between 1865-1872. Photos: Mary Jackson, from Orangeburg, South Carolina, in a hospital in August 31 – Sept. 19, 1868, suffered from a disability. Records of patients for Nov. 1866 in New Orleans, Louisiana.